Summary: Tax Day is coming and, no doubt, it is a taxing time of year! So, what can you do to relax? Even more importantly, what do tax accountants and preparers do to relax after they have looked through all of your fake receipts and mileage expense reports? We are at ESSpa Kozmetika in Aspinwall looking for relaxing measures for all of our guests: Mike from Switcheroo, relaxing steelpan music by David Pugliano of Barrels to Beethoven, and suggested options to spend the day at Esspa! Listen to the podcast by pressing the play button in the bar below. If you don’t see the play bar and button above in your email, click here to listen while you sit at work, work out or walk your monkey! What was on the blog: Brackets/tax day contest chatter—NOMINATE and receive a signed Kessel puck in addition to the spa treatment. PGH MAGAZINE TALKING POINTS FOR NEXT WEEK!!! QUESTION OF THE DAY: What do you find TAXING… if you could pay someone to do ONE thing for you EVERY DAY… what would it be? 04:35 Eva and Scott of ESSpa Kosmetica talk about the spa, why the Hungarian influence is important AND… the contest. 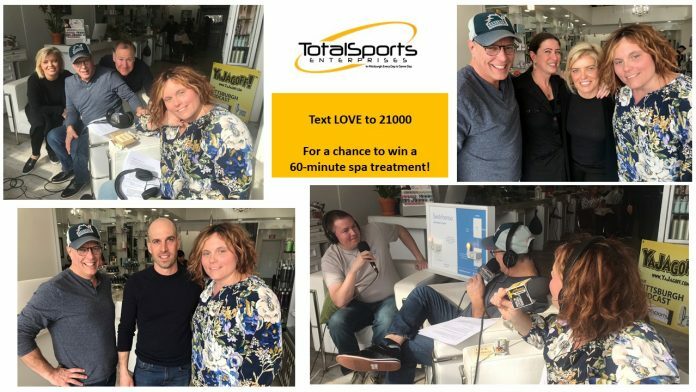 You can win a 60-minute spa visit by texting the word LOVE to 20001! Do it! 23:08 Mike from Switcheroo. From kickstarter to production! Switcheroo is ready for your home. Everyone is invited to the launch party. The party is at AlphaLab Gear on Friday, April 20th. The invitation is open, so bring whomever you would like; the more the merrier. Just be sure to register either through the Facebook event or the Eventbrite link. 38:08 Heather from ESSpa Kosmetica… get rid of that uni-brow! But seriously, this is an art. Heather is the expert! Thanks as always to Hannah & Wayne for the production. Previous articleBack At It.. With a PeterParkers Pic!